Mr. Quinby's going to college, Mrs. Quinby's going to work. Now that Ramona is eight, she can go to a new school with a new teacher and ride the bus all by herself. But after school she has to stay with Grandmother Kemp and be nice to that bratty little Willa Jean until Beezus--who's tempermental enough to ruin anyone's day--comes to take her home. Life isn't as easy for Ramona as it used to be. All the Quimbys have to adjust, and Ramona gets her chance to prove that she's "big enough for her family to depend on." 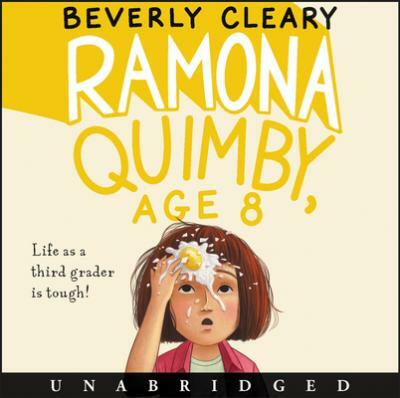 Ramona's job is to be nice to fussy Mrs. Kemp, who watches her while her mother works. If Mrs. Quimby didn't work, Mr. Quimby couldn't return to college. On top of all that, third grade isn't turning out as Ramona expected, even though she enjoys her class's new reading program, D.E.A.R. Danny the Yard Ape teases her, and, on one horrible day, she throws up--at school. Being eight isn't easy, but it's never dull!